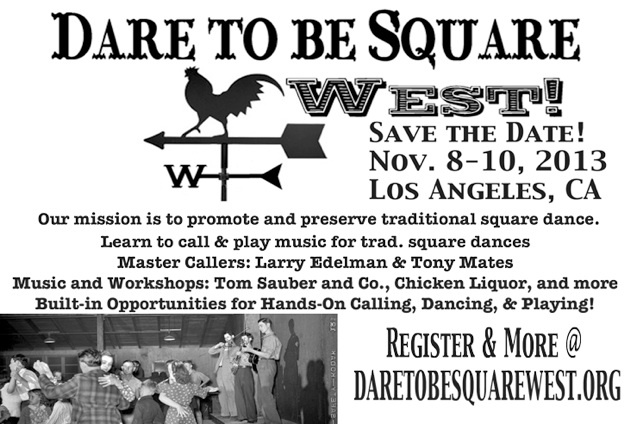 Nov 8-10: Dare To Be Square West! L.A. is excited to be hosting Dare To Be Square West! Thurs. 5/17, 8pm, $5 – $10 donation: Kick Off Party! Full Kick Off details and band bios here. Sat. 5/19, 12-11pm, Workshops & Square Dance! Worskshops Description & Sign-up HERE. Full Square Dance band bios here. LAOTS and More in folkworks! For decades, the greater Los Angeles area has been an unlikely nexus for some fine players of old time music including legends Mel Durham, Ed Lowe and Earl Collins. Contrary to what some have thought, there has always been old-time music here. However, in the past couple years, things have dramatically changed. We are experiencing the first chapter of an old-time renaissance. I’ve added my two cents by teaching old-time music, writing this column, and co-founding the old-time string band Sausage Grinder. But others have made different contributions that have really brought the spotlight back to Los Angeles. For starters, members of the old-time trio Triple Chicken Foot created an Old Time Social event that is in its fifth year now. It brings bands, workshops, jammers, and dancers together for three days. It is not to be missed. In all, L.A. has several old-time jams in a variety of locations to choose from, square dances (with live old time music), homegrown old-time performers, lessons & workshops, square dances and a strictly old-time festival. ‘Tis time to rejoice! Take a swig of your favorite homebrew, grab a fiddle and dance the night away. 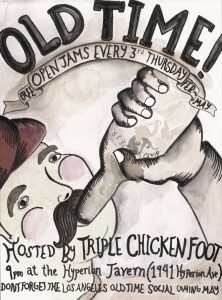 -Hyperion Tavern Jam-3rd Thursday from 9:00 onward at the Hyperion Tavern. Led by The Foot. It’s a neighborhood style jam, with beer and all the fun that comes with playing in a (ex-leather) bar. Triple Chicken Foot — Having played together for more than five years, Ben Guzman, Kelly Marie Martin and Mike Heinle, have focused on playing straight Old Time music rooted gospel songs, archaic banjo tunes, or crooked fiddle tunes. They have also recently finished recording their second full length CD titled Tar River to be released in early May 2010. Sausage Grinder — Sausage Grinder, Los Angeles’ premier jug band, has just released its debut CD, Delicious Moments. The six-piece acoustic ensemble – fiddle, guitar, banjo, mandolin, washboard and jug – combines the old-time sound of bands like the Carolina Chocolate Drops and Camp Creek Boys with the low-down sound of old-time blues, topped off with a touch of ragtime and hillbilly jazz. The Earwigs-an OT instrumental string band found at many of the local contra dances featuring the renown playing of Steve Lewis and Tom, Patrick & Mike Sauber. They’re practically a family!! Frank Fairfield — California-based fiddle, guitar, and banjo player, and ardent 78 collector Frank Fairfield has made his living as a musician, often found playing on the streets of Los Angeles. 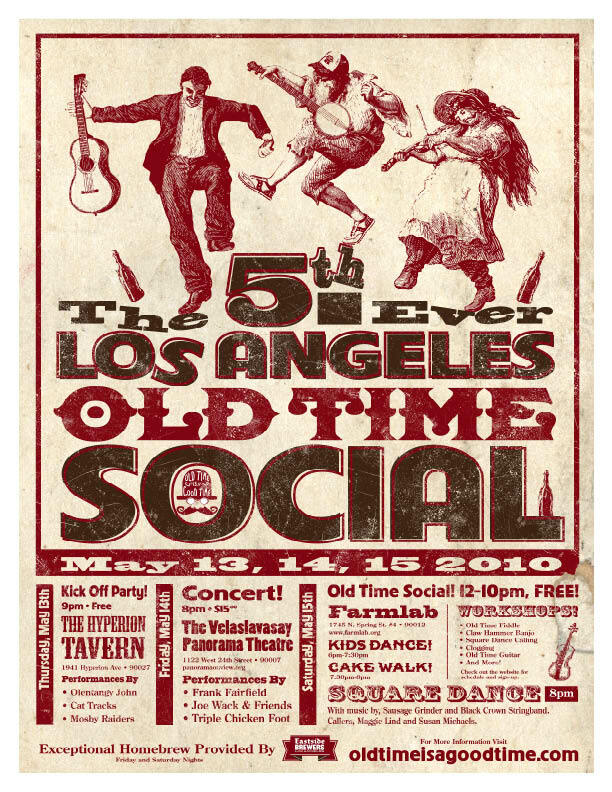 Five years ago Triple Chicken Foot launched the 1st Ever Los Angeles Old Time Social. Starting on the Thursday before the Topanga Banjo and Fiddle Contest, the Social invites folks to play music for four days straight. It is old time only, and takes place in the center of Los Angeles proper. Every year hosts a show at the Hyperion Tavern on Thursday. Friday is a sit down concert with three acts. Saturday is an all day event with jams, workshops in fiddle, banjo, guitar, and square dances for kids and adults. Having been up and down the west coast attending various OT festivals and gatherings, The Foot wanted square dances in LA! They saw square dancing as the next step in community redevelopment and of course another opportunity to play music. In 2009 they put on over 10 dances! More are planned for this year. They have been thrown on traffic circles, at bicycle events, and community gatherings of all types. 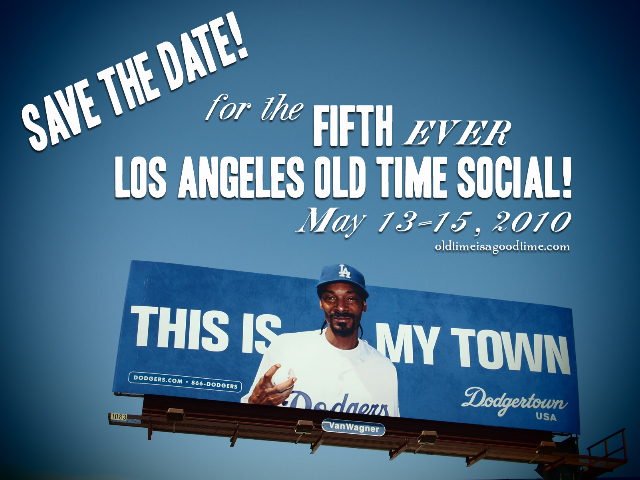 Oldtimeisagoodtime.com is the TCF website informing the LA community of what is going on in the Old Time world. It is a production company of sorts, hosting concerts, putting on Square Dances, and facilitating information for the Los Angeles Old Time Social. The root purpose is to be an active voice of the Old Time community, and a resource to allow ideas in Old Time to be tried and fleshed out. David Bragger is a Los Angeles-based instructor and player of old time fiddle and banjo music. He also photographs, films, and collects the lore of traditional artists, from puppeteers in Myanmar to fiddlers of Appalachia. The 5th Ever Old Time Social is nearly here! Click here for all the Social info! Click the image for a full size jpg! Posters design by Eric Junker – They’ll be for sale at the Social! 12:30-2:30pm – Intermediate Old-Time Fiddle with Tom Sauber: Please email mike@triplechickenfoot.com for registration & questions. 1:00-2:15pm - Beginning Claw Hammer Banjo with Steve Lewis: Have a banjo and are wondering what to do with it? Seen Triple Chicken Foot and want to play banjo like Mike Heinle? This is the workshop to get you started. We’ll be working on the essentials to get you up and running on clawhammer banjo starting from square one—tuning the instrument; basic clawhammer technique; keeping your banjo happy and healthy. You’ll leave knowing those things and playing a tune or two as well! If you already play and just want a refresher, you’re welcome to come, but the focus will really be on the foundation elements of clawhammer style. Limit of 12. Please email mike@triplechickenfoot.com for registration & questions. 2:30-3:45pm - Advanced Claw Hammer Banjo with Steve Lewis: If you already play clawhammer style and are looking for more, this is your workshop. We’ll review the essential elements of clawhammer style and then focus on fluently combining them in different ways to create the many rhythmic and melodic variations you hear in good clawhammer playing. I’ll teach two or three tunes, but emphasis will be on learning how to adapt what you already know to playing with others, especially with fiddlers in jam settings. If you want to review/practice your hammer-ons, pull-offs, slides, and drop-thumbs, come to the beginning workshop and then stay for the advanced session. I’ll have some tunes written out in tablature, but the goal is to develop your ear and technique to play with others without it. We’ll have a fiddler in attendance to practice with. Limit of 12. Please email mike@triplechickenfoot.com for registration & questions. 2:30-3:45pm - West Virginia Fiddle Tunes with Joe Wack: Please email mike@triplechickenfoot.com for registration & questions. 2:30-3:45pm - Clogging with Ruth Alpert: Please email mike@triplechickenfoot.com for registration & questions. 4:00-5:00pm – Old Time Fiddle Tunes of Kentucky with David Bragger: The objective: To leave the workshop with the bowing and notes of some wonderful eccentric fiddle tunes. Please bring an audio recording device. David Bragger plays fiddle and mandolin in Sausage Grinder, an old-time/country and blues jugband based in the Los Angeles area. David teaches old-time fiddle, banjo and mandolin to students of all ages and levels. His students have won awards at festivals from Topanga Fiddle Banjo Festival to Galax, Virginia. Most importantly, he shows you how to have a foot-stomping ruckus of a good time! Please email mike@triplechickenfoot.com for registration & questions. 4:00-6:00pm - Square Dance Calling with Susan Michaels: Learn how to call squares for your friends and family. Beginners welcome. Please email mike@triplechickenfoot.comfor registration & questions. Or just show up and get your dancing shoes on. 4:45-6:00pm - Shape note singing with Jessica Catron & Jeremy Drake: Shape note singing is a uniquely American tradition dating back to the late 18th century that brings communities together to sing polyphonic hymns and anthems. It is a proudly inclusive and democratic part of our shared cultural heritage, designed to facilitate congregational singing. You are invited to come learn as well as participate in this unique, alternative musical language. No prior singing experience or musical knowledge is necessary. The music is easy, the sound is joyously resonant, and all voices and ages are welcome — a willingness to sing is the only requirement! Please email mike@triplechickenfoot.com for registration & questions. 5:00-6:00pm - Guitar with Chris Berry: Chris Berry, guitarist for LA-area jug bandsters Sausage Grinder, with some help from bandmate David Bragger on fiddle and mandolin, will give you the basics on Old-Time Ragtime Backup. Step out past the usual I-IV-V of fiddle tunes and learn to play guitar for raggy instrumentals and songs in several different keys and we might even touch on a little bit (a very little bit) of theory, too. Bring a guitar, a capo, a thumbpick or flatpick, and maybe a notebook and/or something to record with (no tab or chord charts — look and listen). Please email mike@triplechickenfoot.com for registration & questions. 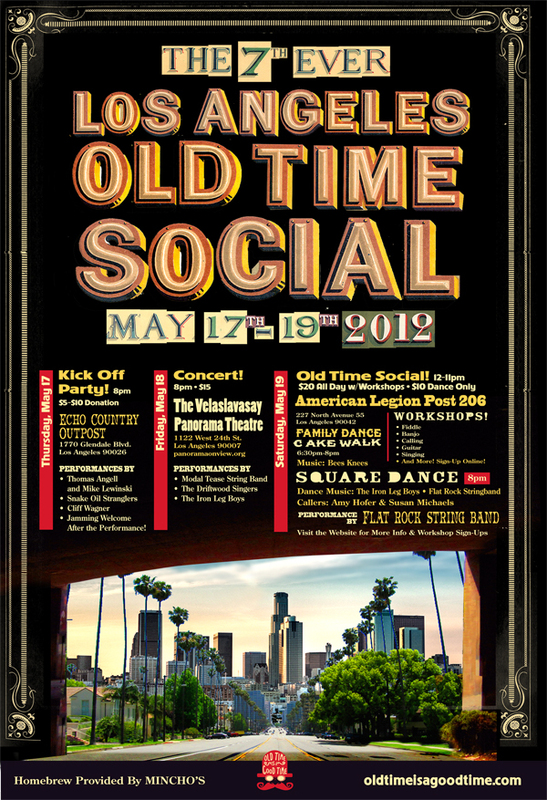 5th Ever Los Angeles Old Time Social: May 13, 14, 15. More details coming soon, check back often! It’s gonna be a good time! You are currently browsing the archives for the Jam category.